Soufflés have a bad reputation due to their notoriously fragile nature. Fearing collapse, those brave enough to attempt whipping up a soufflé have been known to avoid loud noises and even looking at this airy dessert the wrong way. But honestly, soufflés are not to be feared. In fact, soufflés are quite easy to make and as long as you are quick, organized, and cautious, these fluffy custards are impressive to serve and an excellent way to use up extra egg whites. An article in the New York Times dating back to 1908 even warns that the soufflé is "too useful a dish to be lightly condemned" and I whole-heartedly agree. My soufflés were based on a gianduja pastry cream. In general, soufflés are made by adding whipped egg whites (a French meringue) to a base, typically a flavour-infused pastry cream or a roux. This is then baked in any straight-sided vessel, most commonly ramekins, and served immediately from the oven accompanied by a warm sauce Anglaise. One great tip that I learned from my mentor at pastry school was to brush the ramekins with clarified butter in upward vertical strokes to coat the sides, chill, then coat with sugar. This creates fine ridges which allow the baking soufflé to slide upwards. Also, after filling and leveling off the ramekin, run the tip of your thumb circumferentially along the rim (creating a small groove in the soufflé mix) in order to allow even rise of your soufflés (the above photo compares two soufflés, guess which one didn't get a good rim cleaning!). 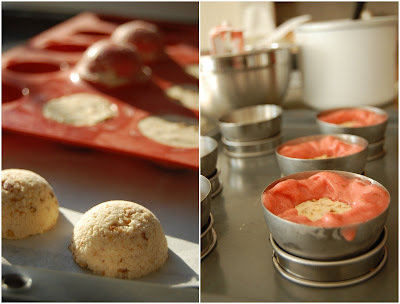 At this stage, the filled ramekins can even be frozen and baked off PRN. Finally, soufflés should not be disturbed so once they are nestled in their water baths in the oven, the oven door must remain closed for the entire duration of baking. This is where experience helps and familiarity with your oven is key since neither poking nor peeking is permitted. Just make sure that your hungry guest is ready to eat when the soufflé is ready in order to avoid disappointment and deflation, respectively. In my case, I had to quickly drop my oven mitts, run with the soufflé to my sunny window, and grab the camera to capture maximum height before worrying about eating! It has been the coldest June in recorded history here in Vancouver. My basil has died and one impatiens has mysteriously disintegrated from the copious rain. The cat has had three hairballs in the last four days and so I need to buy more carpet cleaner. Despite (or perhaps because of) these dreary events, my palate was craving vibrant summer flavours. You might remember that in my last post, I mentioned that I had forgotten to use the strawberry-lime coulis that I had made to serve with my sister's birthday cake. In my typical frugal fashion, this coulis was quickly transformed into strawberry-lime sorbet after adding some more zest and simple syrup. Nothing could taste more like summer to me. An amaretto almond nougatine ice parfait was paired with the sorbet, for textural interest, and assembled into a frozen bombe. 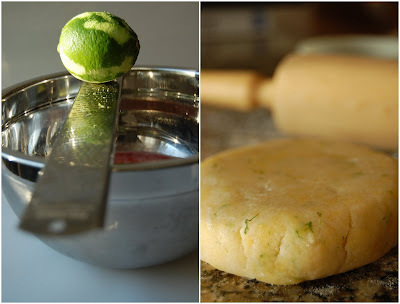 Underneath the dome, lime sablé breton cookie rounds gave support and buttery crispness. I am usually painfully modest but I have to say that my frozen stawberry-lime-nougatine bombe truly is da bomb. If only it could be enjoyed barefoot on the patio with iced tea instead of indoors wearing fleece and winter socks. Summer solstice is in two days so perhaps I will get my wish soon. 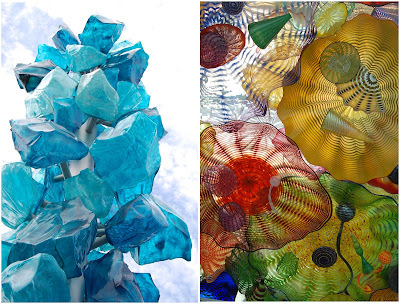 The legendary designs of Arthur Erickson and Dale Chihuly intersect at the breathtaking Museum of Glass in Tacoma, Washington. These two giants of design, each in his own medium, were featured in documentaries recently aired on television here. This prompted us to make a short weekend trip south to experience the architecture and glass exhibits at the MOG. The current exhibition features Lino Tagliapietra who is one of the world's preeminent glass artists. His work is astoundingly beautiful and fluid (no photography was allowed in the exhibition hall, but no photograph could do them justice anyways). Connecting the MOG to the city of Tacoma is the Bridge of Glass, a 500 feet long pedestrian bridge in which three separate installations of Chihuly's work are contained. The centre of the bridge showcases the Crystal Towers, two 40 feet tall monuments created from large glacial blue sculptural crystals cast from a material called Polyvitro. They reminded me of giant blue sugar crystals. In fact, throughout my visit to the MOG, I kept wondering what would happen if a glass artist collaborated with a sugar artist? The ability of sugar to be cast, pulled, and blown to create endless forms mirrors the characteristics of glass but to a limit. Sugar has an impermanence and fragility unlike glass but their qualities in response to light and colour are alike. Speaking of sugar, we headed to Bakery Nouveau (on the recommendation of my boss), a patisserie in West Seattle owned by William Leaman, an award-winning boulanger. 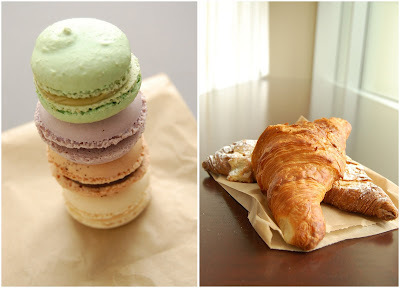 As expected, there was a short line-up out the door; the unbelievable duck sandwich, croque-madame, macarons, passionfruit chocolate tart, and croissants which Eric and I shared (over a period of 24 hours, not at one meal) were simple yet superb.